Times Books/Random House hardcover, 1994, now out of print; Adams Books paperback, 1995, now out of print; newly updated (2015) ebook available in Kindle, $6.99, and Nook, $6.99 as well as an updated 2015 paperback ($14.95). Whether dashing through the Plains, creeping over the Rockies, hurtling across the Great Basin, or threading the Sierra Nevada, the California Zephyr is an earthbound cruise ship bearing as many as 300 passengers, each with a story to tell. One hears tales of trysts in showers and sleepers, of charming serendipities in dining cars, of smuggling drugs and pets (including an elusive boa constrictor), and of a small child’s tragic death on the tracks. The California Zephyr remains America’s most exhilarating train, traversing breathtaking mountain scenery and retracing the route of countless westering pioneers. Veteran journalist and novelist Henry Kisor climbs aboard the train and introduces us to the men and women who ride the rails—some out of restlessness, some as a hobby, some seeking love or friendship as they open new frontiers in their deeper selves. And of course there are the resourceful train crews, who tell tales of “dog-robbing” supplies in the yards, of coping with medical emergencies en route, and of keeping their good humor over the train’s 51-hour run. 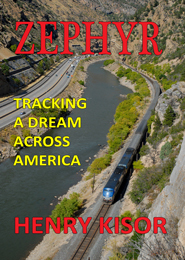 The Zephyr’s route is a passage of surprising connections, as the grand history of railroads, terminals, luxury limiteds, and western bandits exists side by side with contemporary concerns. Through Kisor’s eyes, we participate in all the events that make a train trip magical. Fans of his mystery novels and his other nonfiction books will not be surprised to find Kisor to be an active participant in his story and an affable traveling companion. As we head westward with him at our side, Zephyr becomes more than just a leisure trip, but a personal journey into the heart of America.